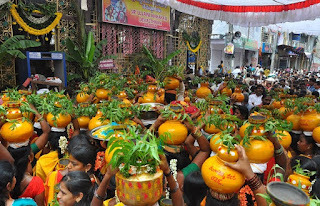 One of the famous festivals that are celebrated in Hyderabad is the Mrigasira festival. Mrigasira festival is also known as Mrugam is celebrated every year during the month of June or July. This festival is celebrated with a feast of local fish which cures asthma. This treatment is more than a hundred and sixty years old. The treatment also includes an additional prescription of herbal medicine, to be taken three times, once every fifteen days which are on Arudra, Punarvasu and Pushyami Karthe days. The medicine is distributed from 5:30 am onwards on Mrigasira Karthika day. The noticeably effective medication is supposed to be taken three years in a row and people from all over the country make all efforts to reach here even under most adverse and unfavourable conditions. People are known to sell or pawn their precious belongings to get a 'guaranteed' cure for their asthma. Most patients reach Hyderabad a couple of days in advance.